Quoted on the subject at a number of recent industry events, HBO programming chief Richard Lombardo has made two basic arguments for this shift (highlighted in the Hollywood Reporter piece about the Leftovers pickup). One is that it—similar to HBO’s adventures in international co-productions with series like Rome—mitigates the risk of expensive productions. The other, however, is that HBO can no longer claim—it was never really true—to be the exclusive home of television authorship. Ryan Murphy, Damon Lindelof, Shawn Ryan, and J.J. Abrams are some of the most successful TV “authors” of the last decade. They have also exclusively been working with broadcast networks and cable channels. While HBO is ostensibly opening the channel up to all studios, it’s really only accepting the studio system as the home of authors who—like David Chase, David Milch, David Simon, etc.—could have value to their brand. It seems highly unlikely that they would accept projects from unknown writers, or writers without the prestige and pedigree of these authors (which is almost more impressive when you consider they did it within the “confines” of basic cable and broadcast networks). I put “confines” in quotation marks both because I am a firm believer in the capacity for broadcast television to be great and because it’s important to acknowledge that premium cable is no longer the only place to tell challenging, or dark, or complicated stories. The gap between basic cable and premium cable is smaller than ever before, both in terms of content and in terms of prestige; FX is now capable of competing with HBO and Showtime for projects like Tyrant (FX won that battle), while due to Mad Men‘s dominance basic cable now has more Outstanding Drama Series Emmy Awards than premium cable (4 to 3). Whereas there was once a time where anyone who wanted to move to television saw HBO as the only respectable option, channels like FX or AMC or—expanding to other alternatives—Netflix have emerged to suggest there are other options. To compete with them, they’re reaching out to creators whose track records make them prime candidates for HBO’s author-driven conception of what makes television—sorry, “not television”—great. I am speculating here, but to address the question directly: It is very unlikely that HBO will allow any television series on its air to end up on Netflix. 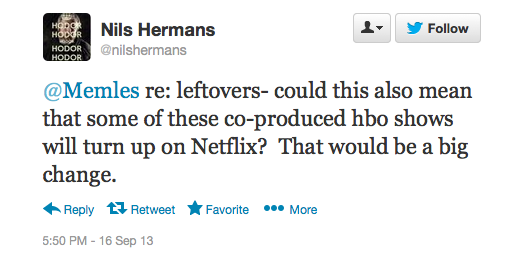 That being said, if The Leftovers were to follow the traditional logics of television distribution, then it would indeed be Warner Bros. and not HBO that would hold its distribution rights in home video and online streaming. The former was likely a big component of HBO’s success in the mid-2000s, in a strong position to take advantage of both the burgeoning DVD market and nonetheless contribute to the syndication market while it remained extremely viable (whereas it is viable but less so today). Working with Warner Bros. means they’re likely giving up at least some of these ownership rights, the same ownership rights that AMC is working to retain by focusing on in-house production (which is paying off with that little show called The Walking Dead). That being said, I would put money on HBO working out specific deals with outside producers regarding online streaming. HBO sees that DVD/Blu-ray sales are shrinking, while the value of online streaming is increasing. It’s also something that makes a more significant contribution to the value of an HBO subscription compared to home video sales: whereas DVDs and Blu-Rays functioned as a way to create word-of-mouth among non-subscribers, HBO GO is an expansive library of streaming content that allows subscribers instant access at a moment’s notice (and on tablets and other devices). HBO might be content with allowing Warner Bros. to profit from Blu-ray sales, but I expect they’ll find a way to retain the value-added potential of HBO GO streaming exclusivity as part of the negotiations involved, and that anyone hopeful The Leftovers will be the start of “Eventually free to stream from other sources” era for HBO will likely be disappointed.